I'm presenting this year's New Year's Eve special early so people worldwide can enjoy RADIOLA! in their own time zones. This four-hour program is a very danceable mix of records I've acquired recently, with plenty of British bands and vocalists. Almost none of this material has been heard on RADIOLA! before. This program will be streamed on my Live365 station starting about 9 PM on the US East Coast. Download the program here: HOUR 1, HOUR 2, HOUR 3, and HOUR 4. A lower-bitrate version of the program (for dialup connections) is available HERE. 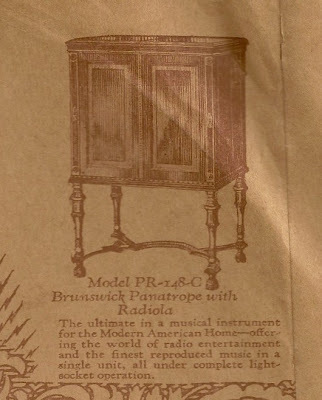 I'm pleased to present this RADIOLA! as a Christmas gift to my listeners--a sampler of excellent jazz, hot dance, and vocal selections that never go out of season. These are all original transfers from recordings obtained through recent record auctions and from wonderful heirloom discs graciously donated by listener Marc in South Carolina. Since WHCL is on Winter Break, this is an internet-only program, with streaming on my Live365 station and now available for download in 128k mp3 format here: PART 1 and PART 2. Have a great holiday, and be sure to check RADIOLABLOG next week for my four-hour New Year's Eve celebration. This will be available for download to play over the course of New Year's Eve in any time zone. RADIOLA--NOW UNDER COMPLETE LIGHT SOCKET OPERATION! UPDATE: Here are the links for the slightly longer version of this program: PART 1 and PART 2. This RADIOLA! is a special broadcast of the interview I conducted with Rich Conaty (host of WFUV's The Big Broadcast) at his home in Hudson, NY. This program features many of Rich's favorite recordings, and a discussion of the history and evolution of The Big Broadcast. This program will be broadcast at 8 PM Friday on WHCL (with direct streaming here). It will also soon be available on my Live365 station, with a slightly longer version of the interview available for download from this site after the broadcast. Henry Lange and his Orch - Hot Piano Stomp (1931) - Gennett unissued test from "The Big Broadcast Volume 5"
UPDATE: This program is now available as a 128k mp3 download: HOUR 1 and HOUR 2. This RADIOLA! settles in with some delightful shellac originals retrieved from two estate sales one week ago today. Included in this trove are six vocal selections from the 1932 "studio cast" of Show Boat. Owing to the Hamilton College hockey game, this program will not be broadcast on WHCL--but will be available for download in 128k mp3 format from RADIOLABLOG and the RADIOLA! Facebook fan page, with continuous streaming on my Live365 station by late Friday afternoon. Many thanks again to Mark Fuller (host of RETRO RADIO, heard 8 PM Saturdays on WHCL-FM) for directing me to where these records lurked. Get Stuffy in Your Stocking For a Schaapy Holiday! This RADIOLA! counters the chill and darkness with levity, classic jazz, vintage shellac, and excellent vocalists. This show will be broadcast Friday at 8PM on WHCL-FM 88.7 (with direct streaming here). It will be uploaded to my Live365 station shortly. Confetta picked this site as one of the best. Surprised? You bet. But grateful--Thanks, Confetta! Though when my wife finds out I'm a raconteur, I may have some explaining to do.